Backyards are getting smaller and smaller, and long gone is the Australian dream of an acre for everyone. But, this doesn’t have to be a bad thing; in fact, smaller backyards can often become the most beautifully landscaped backyards of all. So, don’t despair that you don’t have enough room for a pool, a tennis court and that grand Versailles-inspired garden, instead make use of all the benefits that a small backyard has. During our time in the industry we’ve worked in all sorts of spaces and these are a few of the landscaping ideas we’ve picked up along the way about how to get big results in small spaces. Big things come in little packages and a small backyard gives you every excuse to be bold with your designs. Go for brightly coloured plants and don’t be afraid of using unexpected elements. Going bold with colouring means that your eye will be drawn to the colour and the rest of the backyard will look bigger. Subdividing your little space is actually a great landscaping idea to make your yard seem bigger. 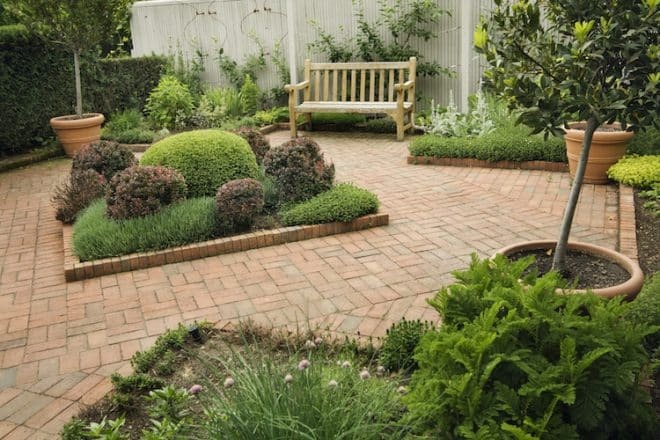 Create little squares that each have their own personality—you could have a Japanese garden in one corner, a little patch of turf in the middle and maybe a raised decking or garden bed in another corner. By introducing lots of elements, you create the illusion of space. You have to be careful not to be too busy though, that’s why keeping element separate is the best way to approach a small space. A small space needs a grand focal point, something that will catch the eye and distract form the lack of space. A pergola or arbol is a great way to do this as you can frame the rest of your landscaping ideas around these centerpieces. A raised decking or a water feature could also work as focal points – the key is to distract the eye from the lack of space so make sure you go grand with your centerpiece. You need to be a master of visual illusion to make the most out of a landscaping a small backyard. So, use long lines to stretch out the area. You also need to go vertical, not horizontal with your vegetation. A line of tall trees will create an idea of both width and height, you can also have two garden beds run in a straight line before meeting in the middle at the back of the space. All this will create a perspective that makes the garden seem like it is stretching away, almost beyond sight. You want to create an idea of space where there isn’t any when you’re working with a small area, but you also need to use the smallness to make it a very intimate space. Turn your small backyard into a private sanctuary by screening off the outside world, using bamboo or aluminium slat beams. You can also create a little nook in the backyard, maybe a day bed or a small piece of decking that is just for you. Surround the area with your favourite plants and include a water feature and turn that spot into the place that takes you away from all the worries of the day. You’ve got a small backyard so there’s no excuse for having a single centimeter of dead space. Use everything, plant creepers up the fence, create vertical herb gardens and figure out a way to turn the hose-reel into a work of art. You have to get creative with small spaces. When creating a design for a small backyard, it need to be filled with detail, there can’t be a single element that is incomplete or untouched. The worst thing you can do with a small space is keep it flat, creating levels within your space will not only create an idea of space it will also allow you to make the most of your space. By using levels you can have a decking that goes up into a garden bed that goes up into a day bed that goes up into another garden bed. By doing this you’ve created an interesting look and you’ve managed to fit a decking, a day bed and two garden beds into a space that at first glance would only fit one deck and a small garden bed. So, if you have a small backyard or front yard that needs some design, don’t despair. You don’t need a huge space to have a beautiful backyard. Instead, you have the advantage of being able to turn your small space into your cozy, tranquil little retreat. We’ve been helping people turn their backyards into truly spectacular works of for over 20 years and we’re masters at landscaping ideas for small spaces. Contact Everlast Services today and we’ll be able to work with you to turn your dream into a reality.